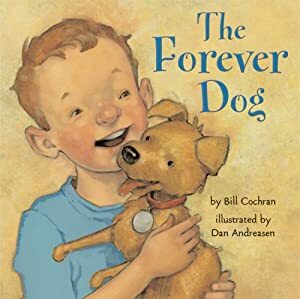 The Forever Dog is a new book by Bill Cochran that tells the story of a young boy’s relationship to his dog Corky. Sadly, Corky dies early on in the book, so much of the tale is about the young boy’s stages of grief as he in turn is sad, angry, and finally happy about this important dog in his life. Adults will have a hard time reading this book without themselves feeling sad about their own personal losses, while kids who have not yet had to experience a death will be blissfully unaware of what the story means. It does, however, introduce concepts that are new for most kids, and could help ease them into what death means. Be prepared to answer your child’s own questions about your longevity if you pick this up to read at bedtime. This book may be helpful for kids who own older pets, and for whom a preparation for an eventual death is important. I would not recommend it for parents trying to explain the death of a family member or close friend. The book is beautifully illustrated by Dan Andreasen.